conference call today to discuss his upcoming 12-round unification fight against IBF Middleweight World Champion Daniel "Miracle Man" Jacobs (35-2, 29 KOs). Oscar De La Hoya, Chairman and CEO of Golden Boy, along with Jose "Chepo" Reynoso and Eddy Reynoso, also participated on the call. The event will take place Saturday, May 4, 2019 at T-Mobile Arena in Las Vegas and will be streamed live exclusively on DAZN. CANELO ALVAREZ: (Through translation.) Yes, obviously I seen the fight. I've seen the fight. Not only this fight, we watch other fights to see if there is a variety, a change in different styles, how he adapts to different opponents. Based on that, we work on our strategy and prepare for what's coming on fight night, whatever he can bring and the changes he might make. Q. Is your goal then with a victory against Danny on May 4th to fight Triple G a third time this coming fall? That's a fight a lot of people talk about for you two guys later this year. CANELO ALVAREZ: (Through translation.) First things first. We have a tough, difficult fight ahead of us. As a team, we have a goal. The objective of this year so to win all the belts. If Golovkin has a belt, then yes. Why not? We've given the fans two beautiful, great fights. Why not a third? CANELO ALVAREZ: (Through translation.) It's going to be a very difficult fight, especially in the first few rounds. Until the moment that I start adapting and imposing my style it will be a difficult fight because of his style. CANELO ALVAREZ: (Through translation.) He's an opponent that is very complete. He knows how to obviously change guards from south paw to orthodox. He knows how to move in the ring. Very difficult. We know the risk of this fight, and it is a high-risk fight. A fighter of my experience, of my level, has to adapt and know how to adapt to all the levels. That's what we're preparing for. We're working very hard to prepare and come out with the victory. Q. Thank you for taking the time to talk today. There isn't a war of the words between you and Jacobs as there was with Triple G. Do you think there is an added respect between you and Jacobs that there weren't between and you Gennady Golovkin? CANELO ALVAREZ: (Through translation.) No. You guys know me. I mean, it's never been in my character, my trait, to be offending fighters, talking bad about them. What happened in the Golovkin fight was a reaction to everything they said and they did, and they talked about me. This particular case the fans know we're both going to go in that ring, give it 100%, gave it our all, and provide a great fight. CANELO ALVAREZ: (Through translation.) It's like all fights. Yes, obviously fighting on these important dates for my country, you know, May and September are very important for me. They motivate me. That are like all my fights. I love boxing and what I do, and that motivates me in all my fights. Q. My first question would be is there anybody that you fought that's similar to Jacobs style in terms of just the total package that he brings? I know when you fought Lora and Floyd they were both pretty good boxers, but they didn't have the power he had. Gennady Golovkin was a really good power fighter, but didn't have the same agile as Jacobs does. Is there anybody you've fought that has the same boxing ability and punching power that he has? CANELO ALVAREZ: (Through translation.) No, I believe Jacobs has a unique style because he's a very complete fighter. He can box, punch; he's tall, agile. I fought all the styles out there, and I believe at my level with my experience, you put it all together, no matter what's in front of me, I can adapt and overcome. Q. Does it bother you that people keep asking Jacobs does he have to take the judges out of it, does he need to knock you out? Does it bother that so many people feel that you've gotten a few favorable decisions, or do you not think about that at all? CANELO ALVAREZ: (Through translation.) No, I don't think about it. Doesn't bother me. Look, people are always going to have their opinions and think and criticize, but that's part of it. That's part of the game. Q. And last thing just wanted to ask is it's obviously a big fight. There is obviously no looking past Jacobs at all. You've all said you want to unify the titles, and Gennady Golovkin wants a third fight. There are always rumors that that's the fight that's going to be lined up in September. If it was up to you, assume you get past this fight, would you want to fight with Gennady Golovkin knowing how great both fights were, or would you be more interested in fighting somebody that still has his title? Which ones would you kind of prefer? CANELO ALVAREZ: (Through translation.) Look, the objective this year is to win all titles. My goal this year is to have all the belts. If Golovkin has a belt before the end of the year, then yes, we'll gladly fight him. If he doesn't, see where it falls later, how it plays out. CANELO ALVAREZ: (Through translation.) Yeah, you know, that's always part of the game. That's always a sacrifice, is to make weight. Working hard the weight comes off, and that's what we're doing. CANELO ALVAREZ: (Through translation.) I'm going to explain the process. When I first started as a young kid boxing I always dreamed of becoming a world champion, and I had a great example in the gym, (indiscernible) who was a champion. Through that process, through that growth, as you learn with experience and see things, I started challenging myself more and saying, Why one championship? I can go on and win more. I'm still growing and seeing this process, and that's what motivates me, to continue writing history and to continue reaching those goals. Q. Canelo, you have been a professional for many years, more than ten years, and you've achieved a lot of your goals. As you think about your place in boxing history, what kind of legacy do you want to leave for the sport? Do you think about this now that you are a very experienced professional, about this picture of history? CANELO ALVAREZ: (Through translation.) I want to be remembered as one the greats in boxing, and that's why I continue to work hard and continue taking on these type of fights, so I can continue writing history. CANELO ALVAREZ: (Through translation.) I would tell him to continue with that motivation, that enthusiasm, that hard work, that discipline, and continue doing what he was doing. That's how Chepo would always tell me and remind me: You're going to make it to as far as you want to make it. JOSE CHEPO REYNOSO: (Through translation.) Yes, definitely. He listened, but not only listened, would always put it in effect, whatever the advice was. That's what made him who he is today. He wants to, and he said it. He wants to be remembered as one of the greatest that ever boxed. That's why he continues to learn, listen, and put it to play. CANELO ALVAREZ: (Through translation.) No, for me it's very important to fight and continue this tradition as a Mexican. As a team it's important to be fighting on those two important dates like it is, May and September. You know, it's a great responsibility that comes along with it, but it's taken care of with the hard work that we put in. 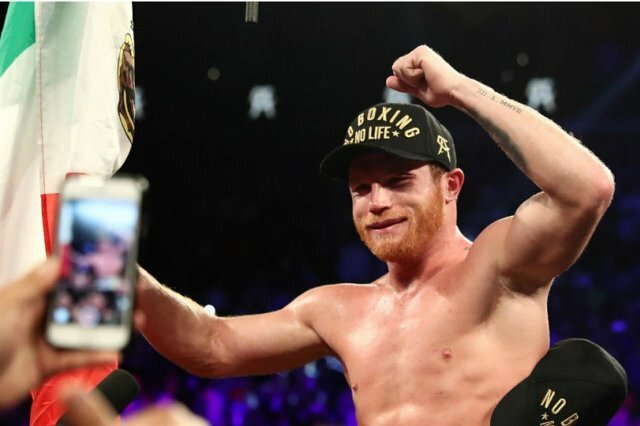 Q. Canelo, I just have one simple question to ask: You've been fighting now in major fights for quite a while, since pretty much the first big fight you had was against Floyd Mayweather. What was its most valuable lesson you've learned since the Mayweather fight? CANELO ALVAREZ: (Through translation.) I've had many fights I've learned. Every fight. At different levels you learn something that, and that is where I am today because of all those fights. The experience I have today is because of fights in the past. But it's not only those fights. It's the ones from here on out. In boxing you never stop learning. I continue to learn and I continue to put it into practice. CANELO ALVAREZ: (Through translation.) Look, right now more than ever everybody wants to fight me, to beat me. Obviously that's the biggest thing for them. They want to come and beat me. We're always exposed to that. In boxing anything can happen. That's why today I train harder than ever, so that it doesn't happen and we continue with victories and continue winning. Q. (Through translation.) WBC requires 30-day pre weigh-in. You've turned it in a lot lower than Jacobs. How do you analyze that he may have to lose it in a rapid pace? How do you see it? CANELO ALVAREZ: (Through translation.) No, look, it's a part of boxing. It's always a sacrifice to lose weight. Some lose it gradually and some wait until the week, the day before. Everybody has their own way of losing the weight. I don't pay attention to that. Doesn't bother me. We just make the weight at the fight. CANELO ALVAREZ: (Through translation.) Yeah, everything is possible. Look, as a team we've always been a team to take on all challenges. That's what motivates and drives me. But right now, the focus is 100% on May 4th and what I have in front of me at this time. But the door is open. It's open and it's possible. Q. (Through translation.) You've always talked about your team, Chepo and Eddy, your family, Golden Boy. What does it mean to you, your fans, all the support you have and all the love you have from your fans? CANELO ALVAREZ: (Through translation.) I'm very grateful for all the support they've given me from the beginning of my career, from the start until where I am today. That's why I continue giving this level of fights, so that I can leave a legacy for my family, my team, and also for them, all my fans that have supported me. CANELO ALVAREZ: (Through translation.) No, I'm a fighter that's very confident in my ability, what I can do, and I don't really -- that doesn't bother me. I've faced the strongest fighters out there and I'm prepared for that and more. I'm an elite fighter that can adapt to that. CANELO ALVAREZ: (Through translation.) No, south paws haven't been complicated for me. I'm a fighter that can adapt to all styles and I have shown it. Jacobs switches and that's an ability he has, but it's impossible that he can be a better south paw than he's going to be orthodox. But that's what we're preparing for. Q. First of all, I want to thank you very much for taking the time out. This press conference is greatly appreciated. Just really goes back to what everyone was stating in terms of your plans of getting all the belts. Is there a particular weight you would prefer to fight at, or is it whoever has a belt you're just going to go out there and challenge them? CANELO ALVAREZ: (Through translation.) No, it's no secret that my ideal weight is 160 pounds, the middleweight division. Look, everybody knows I've always loved challenges, so if there's challenges and title out there, and are titles out there, I'm open to it like I've shown in the past. Q. My other question I have is once again, I'm sure you're very tired of here about Triple G. Seems to be coming up a lot. With the controversy with the Triple G fights, do you feel that's something that is always going to be mentioned with your legacy? Do you feel it's unfair, and that you have had a great career and the Triple G fights keep coming up? CANELO ALVAREZ: (Through translation.) No. It's normal. It's normal. Look, today we still talk about Leonard and Duran and Hagler and Leonard. They're great fights. People are going to always talk about them. Right now my objective is May 4th. That's where my focus is. If a third fight happens, it'll be better than the first two. Right now my concentration and focus is on May 4th.